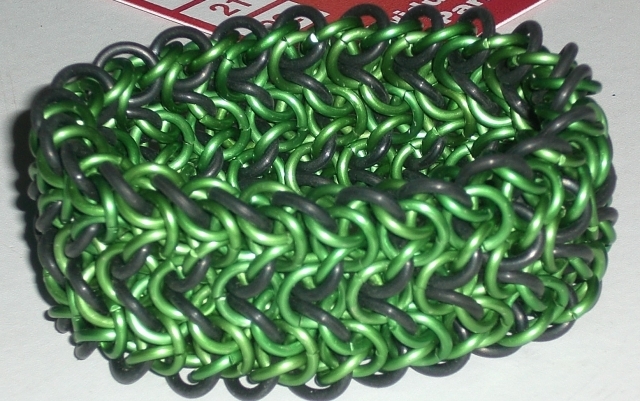 Majestic Maille: New order and weave! Why yes please! So for those that have seen recently I have been able to make Elfweave! Now I personally like elfweave but have a slight dislike of it as well. IT refuses to keep the shape that it is woven into. WELL I have figured out how to fix this! By making it into Elfsheet! Here let me show you a few pictures! Now the elfsheet in the pictures is just 3 rows. Which with the 16g 1/4" Bright Aluminium rings I used is only 1 1/2" wide. It weighs a solid half of a pound or so which is impresive in Aluminium standards. For those that knew about my hatred with this weave, it was purely stupid of me to even consider hating this weave. It did take me some time to get the Elfweave and then sheet down but it was rather easy where as the tutorials online and on youtube made it look harder than it really was. WIth my new order that I will be talking about next I will be able to do something AMAZING with Elfsheet! Let me show you! 3 row elfsheet dark green rings are actual Rubber rings! The above picture is a FULL bracelet! This bracelet has NO connector it is a solid piece. The reason for this is because there are Rubber rings on it. The rubber rings allow the bracelet to stretch and thus no connector is needed. I will be doing this with about 3 bracelets to start and if anyone wants one let me know. When I run out I will make more on demand! Just ask for the price! So this friday I will be placing an order for about $160 worth of materials! 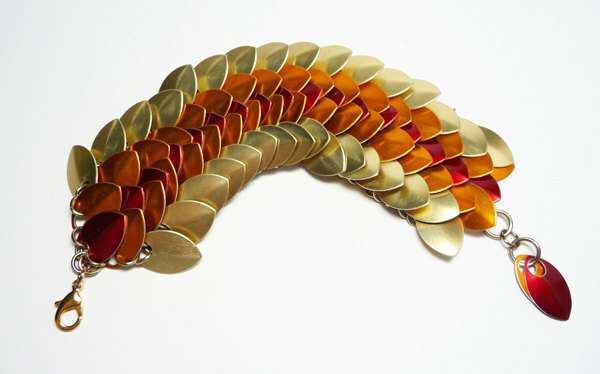 This includes copper, brass, rubber rings, bright aluminium rings as well as some anodized aluminium! I will be making some dicebags for a commission that will be sent out in mid January as I stated with the buyer and that will be my FIRST commission out of state where I currently live! I also have some SCA chains and will have with my some AMAZING 14g copper rings! Now 14g is REALLY thick and for those that have worked with or around chainmaille know it is considered by near amount of everyone as true armor grade for chainmaille! Pictures of this shipment when I receive it!